See that tiny vertical line sticking up against the white background in the middle of the photo? That’s the statue at the Place de la Republique, where we are trying to go to START marching. The “Republican March” was held in Paris today, following a week of horrific terrorist attacks. We went, or rather, we tried to go. After 2 hours, we had advanced 300-400 metres and were still 400 metres from the point of departure of the march, with the announced “ending time” approaching quickly. Like many people, we turned around and headed home, content that we had done what we could, but disappointed that we wouldn’t be counted in the official figures (already more than 2 million by the time we turned around). 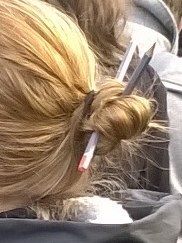 One of my favorites signs of protest, women wearing pencils (the symbol of the liberty to draw that emerged from the Charlie Hebdo massacre) in their hair. It was heartwarming to see this outpouring to uphold the values of liberté, égalité and fraternité. And there were people of all skin colors and religions present. There were even people from many countries, some deliberately marching, some tourists capturing a unique moment. However, there have been some mixed emotions over the past few days. 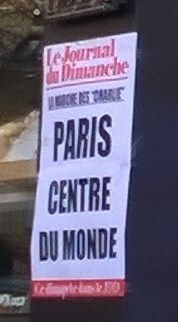 I was a bit shocked to see the publicity for the newspaper Journal du Dimanche this morning that declared “Paris: the centre of the world”, a sentiment that was echoed by President François Holland when he spoke at beginning of the march. I’ll grant you “all eyes are on Paris” (even if that’s a bit of hyperbole), but declaring yourself the centre of the world, might be just a wee tad narcissistic. On the radio, I heard Paris first described as “the capital of the world against terrorism” and later the “liberty capital of the world.” Um, guys, I know you’re in shock and mourning, but maybe a little bit of modesty might be in order. The day’s news coverage confirmed this perception. Naturally the headlines were dominated by the march, but it was rather shocking what was not even mentioned by most news outlets: Boko Haram killed hundreds of people in Nigeria yesterday and today strapped a bomb to a 10-year-old girl that exploded in a market, killing nearly 20 people. The French can be forgiven for focusing on their national tragedy, but they did find space to mention that a German publication that had printed Charlie Hebdo caricatures had suffered from arson last night, while few news outlets gave coverage (at least not prominent coverage) to the horrifying events in Nigeria. A cynic can’t help but wonder why not. Are the victims too poor? Too far away? Where is their hashtag? Greg and I both carried signs in the march referring to the Nigerian situation and had to explain to everyone around us why. No one had heard about the massacres in Nigeria. But this is the same combat: obscurantists want to eliminate anyone who does not agree with them. Other mixed emotions regarding the situation in France relate to some developments that were, alas, unavoidable: the to-be-expected suggestions to trade civil liberties for the illusion of greater security. There are also those who seem to have missed the point about the freedom of expression and want to penalize the use of certain hashtags on social media (not incitement to violence mind you, just hashtags that reflect a lack of empathy about the events of the past few days. On a more petty, but sad level, a spat between the family of the editor of Charlie Hebdo and the woman he was dating about the nature of the relationship. We also have a feeling of relief tonight. We were all aware that the march in Paris would have make a highly symbolic scene for a further terrorist attack, and we are breathing a sigh of relief that it didn’t happen. There is a sense of defiance; a refusal to live in fear, but if there’s one lesson that can be taken from this week, it is that the price of liberty is risk.